April Special: Families will receive a $50 refund across all session, based on two child enrollment (or more). Refunds will be applied to the card used at time of checkout. Offer valid until May 12, 2019. Campers will launch into all things space as they learn about and explore the challenges in returning to Mars and the science, technology, and engineering that will make it possible. Campers will drive, drop, and launch their way through a week full of engineering adventures as they build rockets, design their own mini-cars, and work together to solve problems. Campers will experience a full week of hands-on robotics as they design, build, and program their LEGO robots to complete a range of challenges. Campers will dive into the beauty of science and engineering as they take inspiration from science to shape their art, and inspiration from art to design creative solutions to unique problems. Campers will spend the week using 3D printers, a laser cutter, a vinyl cutter, and more to transform discarded items into works of art. Campers will be immersed in the world of theater as they design set pieces and costumes and perform in their own productions. Campers will step into the world of secret agents as they break out of escape rooms, learn about and create secret symbols in art, and create their own spy tools. Welcome to Summer Camp at The Greene School, where learning is fun! Explore The Greene School by attending a Summer Camp session. Each session is designed to promote engagement with like-minded peers with an emphasis on making S.T.E.A.M. connections. Each camp session is taught by our world-class faculty, each with a Master's Degree or greater. We offer a full-day session with lunch included. In an effort to best personalize each offering, all sessions close after enrollment of 15 students is met. Both Greene Exploration (Ages 4-9) and Greene Academy (Age 10 -14) provide daily academic enrichment for inquisitive and motivated students. Summer sessions are open to all students and provide campers with a sampling of The Greene School’s year-round inspiring curriculum. Each week of Greene Exploration (Ages 4-9) delves into an exciting theme that sparks your child’s curiosity and encourages a love of learning. Participants work with same-aged peers, immersed in experiential learning that enhances the weekly theme. Lessons and projects are taught through an integrated approach, incorporating STEAM (Science, technology, engineering, arts, math) and Humanities (literacy, history, social studies), in ways that will inspire discovery. 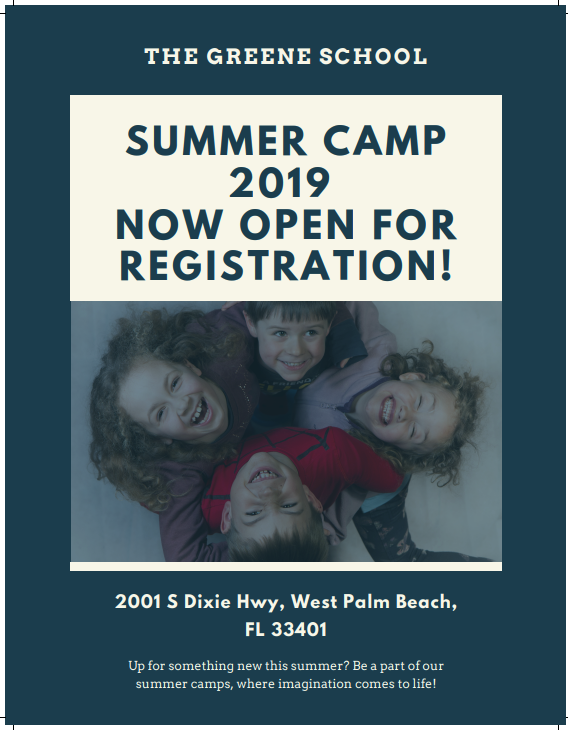 These sessions are designed to allow the opportunity for children to apply what they have learned through a variety of traditional day camp activities, including outdoor exploration, play, special visitors, and creative projects led by our experienced staff. In an effort to maximize personalized learning opportunities, Greene Exploration is split into two groups (Ages 4-6 and Ages 7-9). Summer Greene Academy is a series of enrichment based workshops offered to curious and motivated students entering grades 4-8. Greene Academy allows for a uniquely customized summer learning experience. Our summer educators consist of teachers from The Greene School who are certified, educators and experienced leaders. They are selected for their passion for teaching children and their commitment to lifelong learning. For the safety of all participants, CPR and first-aid certiﬁed individuals are on staff. Price includes all materials, daily nutritional snacks, and fees/tax. Discounted price for the full-day option with an enrollment of more than one sibling. Lunch will be provided. Please contact info@thegreeneschool.com if you have any questions. We look forward to a fun summer of learning.